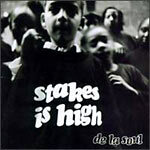 Probably De La's best album to date. These guys spit so well over this album and let us all know how they have matured over time. The tracks are laced with some sick breaky breakish beats accompanied with your favorite MC's from your favorite group! This is hot!